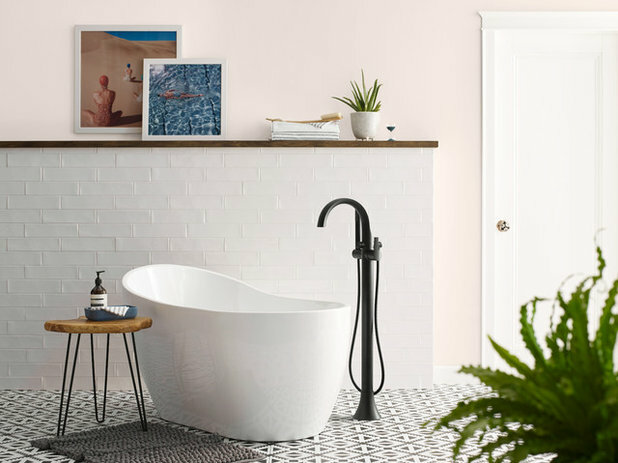 New products and styles of fittings and hardware were showcased at the Kitchen & Bath Industry Show (KBIS), the American industry’s biggest event, held in Las Vegas from 19 to 21 February, 2019. 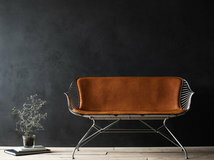 We noticed an expansion of offerings in brass and matt-black finishes, along with a new take on the mixed-metals trend. 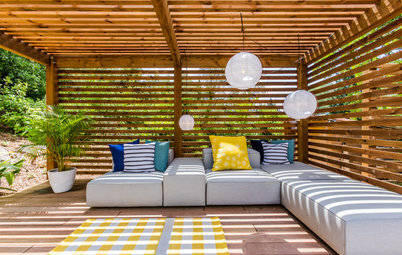 Read on to learn about the emerging design trends we spotted at the trade show for the kitchen and bath industries. 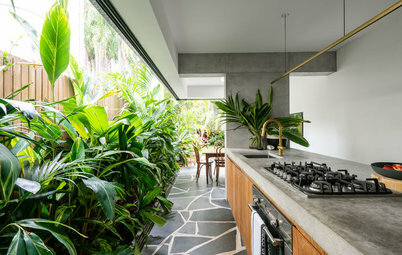 Mixing metals – pairing brass pulls on your kitchen cabinets with a chrome faucet at the kitchen sink, for example – has been trending in home design for some time now. 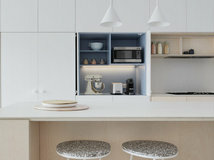 In fact, the majority of renovating homeowners (54 percent) mix metal finishes for fittings and hardware as part of their kitchen redesigns, according to the 2019 U.S. Houzz Kitchen Trends study. 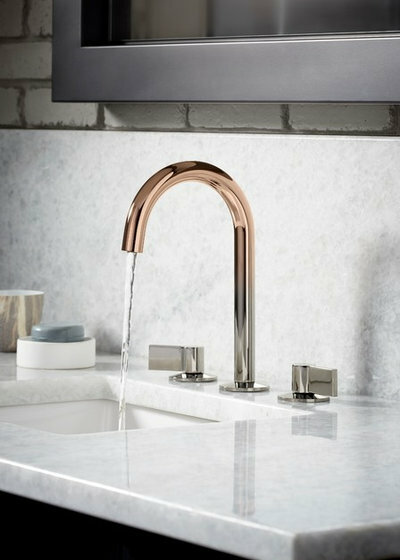 This year, some manufacturers at KBIS took the trend a step further by mixing metals on a single faucet. 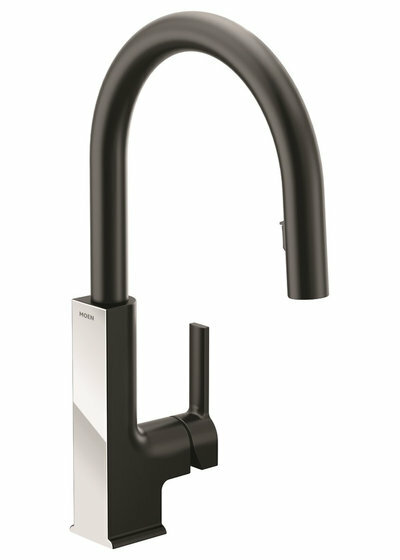 This image shows Moen’s Nio faucet in matt black. It comes with a matt-black handle and also includes an alternative handle in a brushed-brass finish (shown in this image). 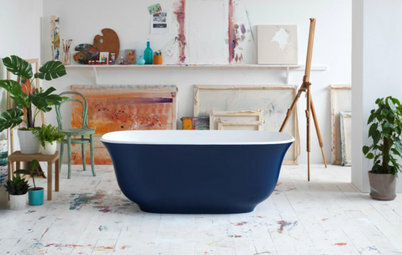 Additional finishes are chrome, stainless steel and, appearing later this year, black stainless steel. 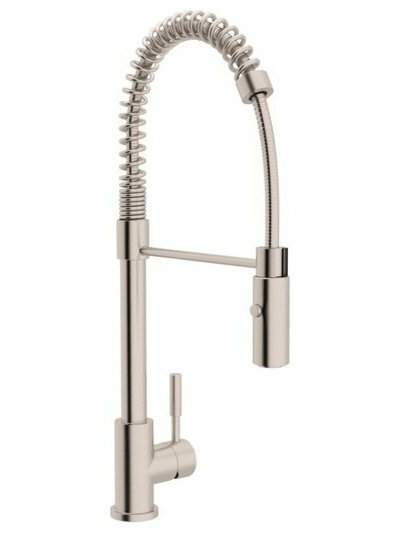 Riobel debuted its Ciclo powder-room faucet (shown here), with a body that comes in chrome, brushed chrome, matt black or brushed brass. 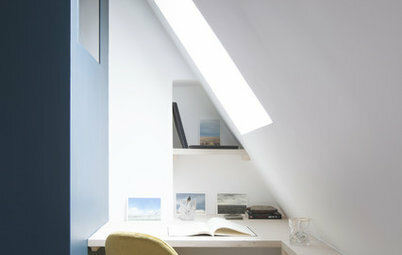 Homeowners and professionals can choose to match the handle to the faucet body or select an accent colour instead. 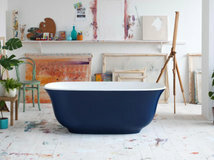 Kohler showcased its Ombré finish, which debuted at KBIS last year. This photo shows a faucet in vibrant rose gold gradating to vibrant polished nickel. The company also offers an alternative finish, vibrant titanium blending into vibrant rose gold. 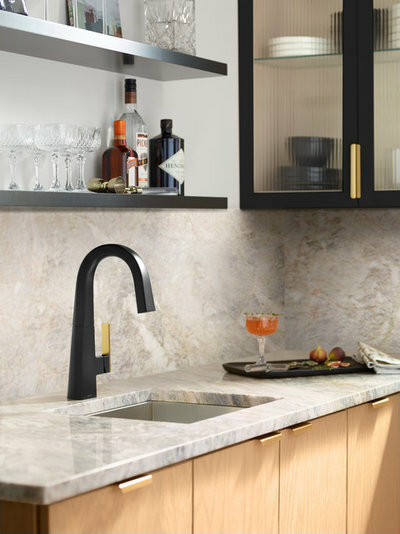 Moen’s new Fusion series of finishes offers another take on mixed finishes, with matt black and chrome on the faucet body. 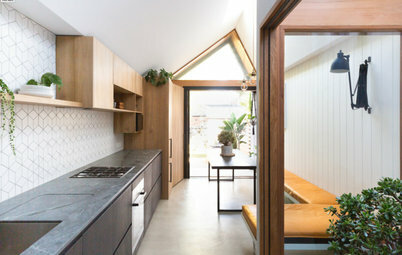 It’s available in the STo kitchen collection (the pulldown kitchen faucet is shown here) as well as the Via bathroom collection. 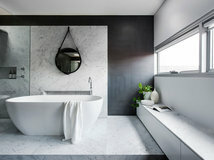 Matt nickel remains by far the top finish choice for homeowners matching their fixtures and hardware in both kitchen and master bathroom renovations, according to Houzz research in the USA. 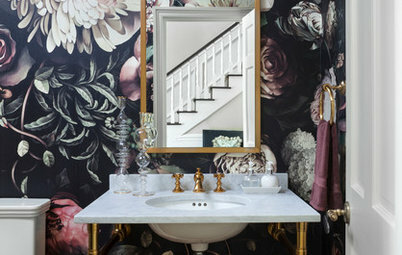 But more homeowners now mix finishes than match them, Houzz research shows, and manufacturers displayed a range of finish possibilities at KBIS. 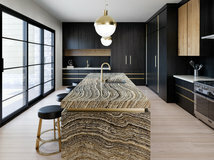 Matt-black and brass finishes were seen across the booths at KBIS, with many companies expanding their offerings of matt black and brushed-gold hues. 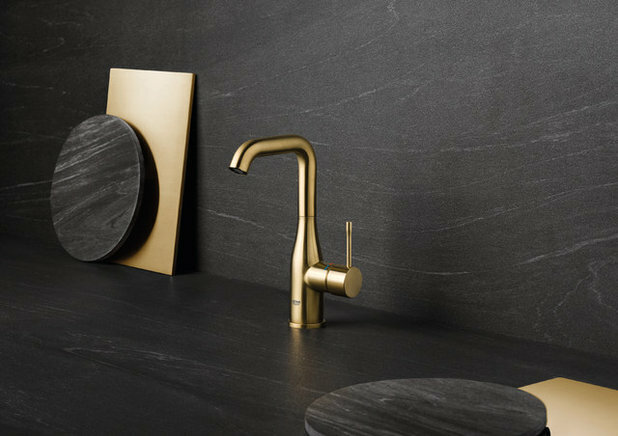 As just one example, Pfister and the brand Fortis, which are under the same parent company, now have 18 kitchen and bath collections that feature matt black and nine that feature brushed-brass finishes. 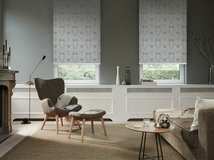 Last year the brands had 12 collections with matt black and two with brushed brass. 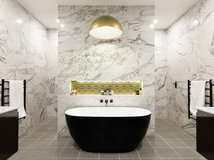 This year at KBIS, Moen introduced new floor-mounted bath faucets in brushed brass and matt black (pictured here). 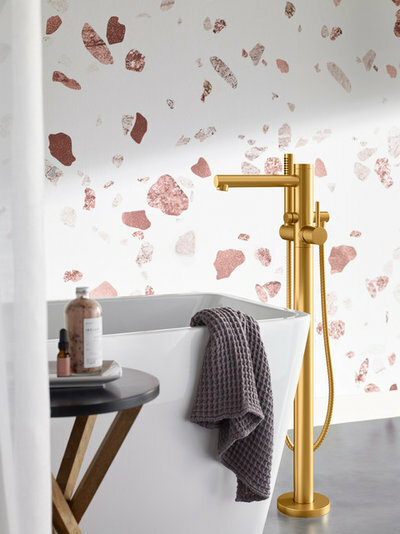 Here we see Moen’s new Align tub filler in Lifeshine brushed brass. 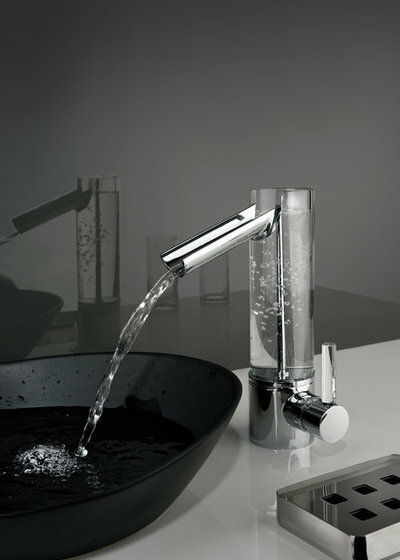 Grohe also added finishes to its Essence faucet collection. 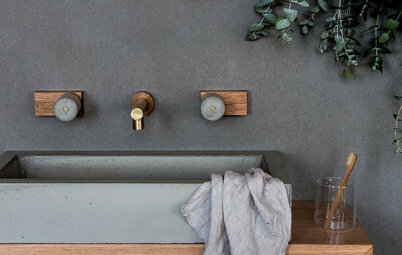 This photo shows the new large-sized lavatory centreset faucet in brushed brass; another finish is hard graphite, which has a similar appearance to black stainless but is a little lighter. Matt black and brushed brass also appeared in the hardware department at KBIS. 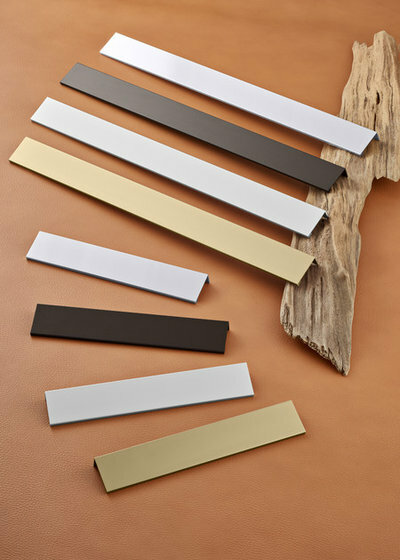 This image shows Häfele’s Elite handle collection with matt-black and brushed-brass finishes. 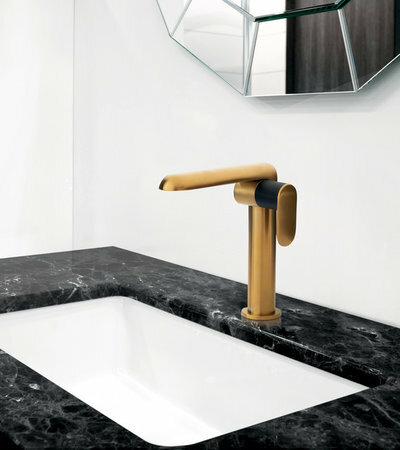 This line of hardware is new and one of three – along with Häfele’s new Modern handle collection and existing Vogue collection – in which matt black and brass finishes were launched. 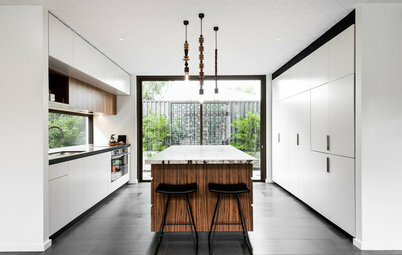 The professionalisation of the home kitchen has been an ongoing trend, with consumers choosing professional-quality stovetops, ovens and range hoods. 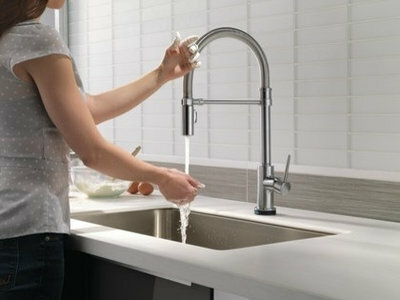 At this year’s KBIS, a number of companies introduced semi-professional kitchen faucets. Most have a pull-down nozzle and look like a scaled-back version of the professional faucets that have a stretchy hose structure and a heavy nozzle spray. 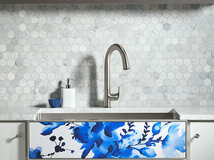 “For the consumer who is creating a semi-professional kitchen, they want to make sure their sink and faucet match,” says Lou Rohl, chief operating officer at Rohl. 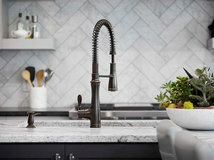 Seen here is Kohler’s Bellera Semi-professional kitchen faucet, which debuted at KBIS along with the brand’s existing semi-professional faucets that have a spray head and pull-down hose. 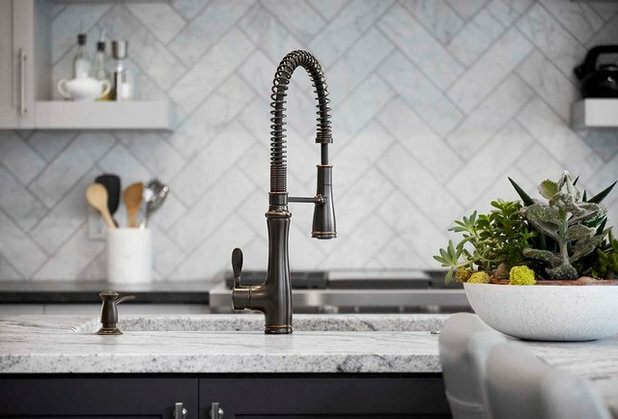 Here is Rohl’s take on the semi-professional faucet for home chefs: the Lux Pro side-lever stainless steel pull-down kitchen faucet. This image shows Delta’s Trinsic Pro, which is equipped with a pull-down spray wand. It is available in chrome and stainless steel. A number of companies showed off faucets with unique designs, including some with an industrial or Art Deco flavour. 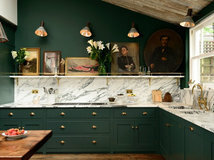 This image shows the Uffizi, part of the line of Italian-inspired and manufactured products from the Fortis brand, highlighted at Pfister’s KBIS booth. 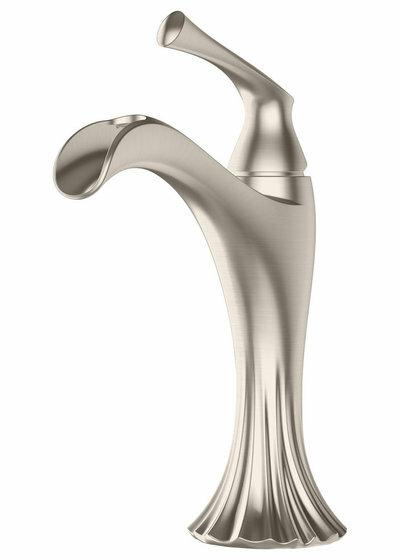 This is Rhen, a new faucet design from Pfister modeled after the folds of a wedding dress belonging to the designer’s grandmother. 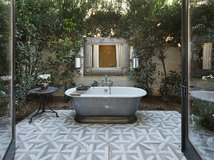 Delta debuted its Broderick collection, an updated traditional series that has been given an industrial twist. 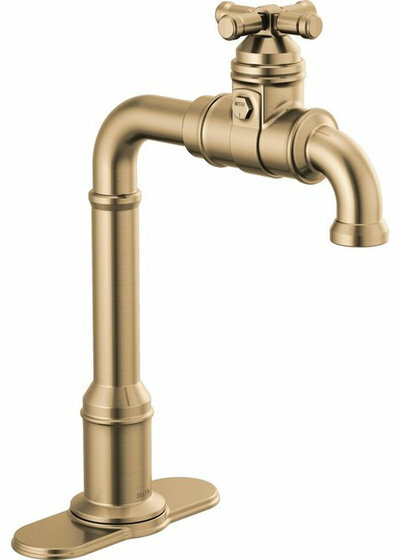 Seen here is the Gentleman’s bar-prep faucet in champagne bronze. 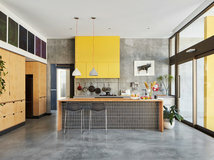 What do you think of these new looks for kitchen and bath fixtures? Share your thoughts in the Comments. 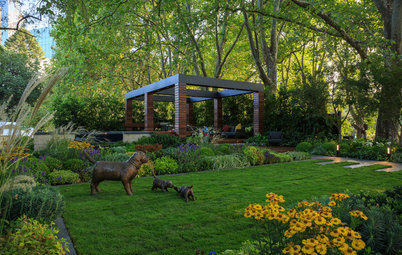 See more of this project in our photo galley.